The number of single-family homes and condos that traded hands across the greater Bay Area totaled 7,122 in March, a 3.3 percent drop in volume versus the same time last year, versus a 9.0 percent gain over the previous year, according to recorded sales data from CoreLogic. 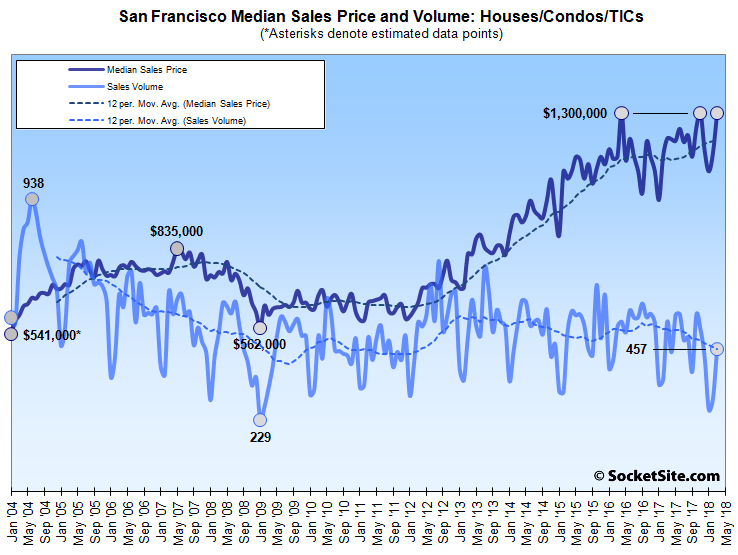 And in San Francisco, the recorded sales volume of 457 transactions was 16.1 percent lower on a year-over-year basis and the slowest March, in terms of transaction volume, since 2009. In Alameda County, recorded homes sales in March (1,504) were down 3.1 percent on a year-over-year basis, while sales in Contra Costa County (1,423) were down 5.8 percent and sales in Solano County (566) were down 8.9 percent. At the same time, home sales in Santa Clara County (1,657) were 3.0 percent higher on a year-over-year basis and sales in San Mateo County (593) were up 1.9 percent. While home sales in Napa (99) were down 31.7 percent versus the same time last year, home sales in Sonoma County (587) were up 9.7 percent as the post wildfire recovery continues. And March sales in Marin (237) were down 9.9 percent, year-over-year. The median price paid for those aforementioned 457 homes in San Francisco was $1,300,000, matching the record-tying mark last reached in November and 11.8 percent higher than at the same time last year. The median sale price in Alameda County was $810,000 last month, 11.0 percent above the mark at the same time last year; the median sale price in Contra Costa County was $591,000, 8.4 percent higher on a year-over-year basis; and the median sale price in Solano County was $425,000, 11.0 percent higher than in March of 2017. The median sale price in Santa Clara County ($1,200,000) was 33.6 percent higher than at the same time last year and the median sale price in San Mateo County ($1,320,000) was 25.7 percent higher, year-over-year. Up in Marin, the median sale price was $1,143,500, 23.0 percent above the mark in March of 2017. The median in Napa was $610,000, which was 2.1 percent above its mark at the same time last year, and the median price in Sonoma was down 4.5 percent to $530,000. Across the greater Bay Area, the median home sale price was a record $820,000, 14.7 percent above the mark at the same time last year. kinda looks bubbly but trying to predict a drop in Frisco real estate is a sucker’s game. I’ll never forget the caterwahling in early 2009. More screeching than Democrats at a dinner party. Everyone wanted prices to go lower – so they could buy. Keep in mind that the 2007-era cycle was nationwide and the subsequent decline really did pose a huge risk to the US banking system and global economy. That “caterwauling” you refer to was a force that led to a bailout of the banking/housing market of unprecedented scale. There was $4.5T (that’s Trillion!!) of Quantitative Easing alone. Not only did “everyone” not want prices to go lower, but instead there was a massive governmental effort to ensure that they did not go lower. $4.5 Trillion has a lot more effect on a market than a bunch of Realtors holding hands and singing “There’s never been a better time to buy” to the tune of Kumbaya!! Most people here who are beating the “This time it’s different” drum are trying to claim that this cycle will have an up, but not a down. While I don’t see much evidence for that claim, I do think that the aftermath of the down cycle will be different. The 2007 cycle was very broad, affecting the entire nation (and parts of the ROW), the weakness in housing prices caused huge economic turmoil and threatened the global economy, This cycle is much more narrowly confined to certain coastal markets. A drop in SF housing prices will not even cause a sniffle to the US banking system. A broader coastal drop might be a mild cold, but nothing compared to the life threatening illness of the 2007 down-slope. But if a $1.5M condo drops to $1M, what’s the difference between the former and subsequent resident? If a $5M home drops to $3.5M, is the neighborhood going to look any different? Price is what you pay, value is what you get. A San Francisco down cycle is only about price. In lower end areas a price down cycle can initiate a vicious down cycle of value destruction. Also, San Francisco has demand drivers (Apple, Google, Facebook, etc.) that don’t exist anywhere else. That’s a huge help to propping up our RE prices. Inventory is at a low point. Actually, it’s not. It bottomed in 2015, at least in San Francisco proper. Right. That was another low point. Feel free to chill sometimes. Our apologies, we thought you were suggesting that the current “low point” in inventory, which was actually lower in 2015, 2014 and 2013 as well, was the reason for the 9-year low in sales. OK. I’m saying that low inventory plays a role. Couple that with price points at or near all time highs. It doesn’t take a logical leap to see why it might be that fewer properties trade. Choices are limited, and dear, for both buyers and sellers. Yes, I agree it’s insane as well – prices appear to be increasing across the state – increases in the interior always comes with a delay. The increase in interest rates should curb it, but we may be seeing buyers jump in now before it gets even more unaffordable. One could argue that interest rates should have started their climb a couple of years sooner – by now, the data above will make the feds rush to increase rates faster, and the economy will go into a recession. As few here – SF or Oakland boosters – will admit, the SV – Santa Clara and San Mateo counties – are/have been the drivers of the Bay Area’s economy over the past decade plus. Slowing is occurring in Alameda, CC and SF counties while SC and SM counties still, by certain metrics, boom. The core BA counties, SC and SM, will/would be the last to show falloff. Already those counties are showing a decrease in population and job growth. The rest will follow. Once the SV sneezes, the rest of the BA will get a cold. What’s the source that these counties are decreasing in population? I thought that all Bay Area counties had increasing population. It’s a common mistake. People look at DOMESTIC migration, where Bay Area count is are loosing population. If you also consider INTERNATIONAL migration, Bay Area is still gaining population. Prove that. Then stop saying loosing instead of losing. I don’t see the Bay Area in that data. If you want to see where people are moving to, there’s a census flows mapper. For the county totals, the American Fact Finder census site has it. You can select which years and geographies (i.e. county, state,…) you want to see. Santa Clara and San Mateo also have negative domestic migration. So SF’s population grew by 8000 in 2017? Wow, that’s much higher that I would have guessed. And to make it clear, the classification of Domestic vs International migration for this purpose is based on the location of the start/end of the move, *not* the nationality of the person moving. A US citizen returning to SF from overseas is a International in-migrant. A foreign national moving from SF to Hayward is a Domestic out-migrant. A lower rate of increase is still an increase. The original claim was that Bay Area counties are losing population. That is false on the evidence. Dave & Pero’s statements seem a bit muddied and unclear to me, so I’ll let them speak to their own statements. But yes, SF, SC and SM all had total population gains in 2017 from the census data. But also, all three had negative net domestic migration. Additionally, SC and SM had negative net total migration, with only natural increases pushing them to positive population growth. To clarify, a decreased population growth is not the same as a loss in population. The Bay Area is still growing but at a relatively anemic pace compared to Seattle, Portland, Phoenix and the Texas cities. If this growth disparity continues for the medium and long term it will have significant ramifications on the relative importance of the Bay Area as a metro center. If SF grew by 8000 people last year, that would be 80,000 per decade, roughly a 10% gain. This is hardly anemic. This is robust growth. 8000 in 2017 is about a 1% growth rate. Same as the national average or a bit less. Seattle is growing at 3.4%/year. Portland a little less. Phoenix is growing at almost 4% a year. So, compared to many of the robust metros, SF/the Bay Area is experiencing anemic growth. There is quality and there is quantity. Who admits more students DeVry or Caltech? Which one is more influential? It would not surprise me at all to see the BA and/or SF have slowing or even negative population growth in some areas. But this wont mean that the BA is losing influence. During an upcycle, there are people (and companies) here whose productivity (and profitability) would not allow them to remain here in the steady state. But as long as prices (or valuations) are rising, then none of that matters. If they wash out during a down-cycle, it’s a case of “easy come, easy go”. The booster myth is that *everyone* can be an elite tech superstar with a SF condo. But just because that’s false doesn’t mean that *no* one is an elite tech superstar and that those superstars won’t want to be here. Tech and SF have had many ups and downs. I don’t see much to support the idea that this is the one boom that won’t bust, but nor do I see any evidence that points to this bust laying the region down for the count. The original claim was the San Francisco was losing population. The fact is that its population is growing, and at a healthy clip. SF populist not only growing, it growing almost exclusively by very high quality peeps with well paying jobs. Who cares if Seattle is growing faster; It’s Devry university (Seattle) vs Caltech (SF) heh….heh. International migration happens preferentially into bigger cities. No one grows up dreaming to move across the ocean to Fremont or Hayward. Though that’s where they may end up after initially landing in a larger city. According to Redfin, in Q4 last year, the SF Bay Area saw the highest net outflows in the country by a good margin. Dave will be happy to hear that Seattle was the #1 out of state destination for these folks. As for international migration, many of the H1Bs are just replacing a current resident that got laid off from the same job. That’s not the same as the population dropping. You can either trust redfin seaches, U-Haul truck counts and some bogus ‘life satisfaction’ polls or you can trust the U.S. Census data…..
“Many of the H1Bs are just replacing a current resident that got laid off from the same job”. Yes, computer engineers from India with PhDs from Stanford are just replacing West Virginia coal miners. If this explanation helps you feel better and make sense of the world…sure, that’s exactly what’s happening. Well I know two people who were gainfully employed as IT workers in San Francisco, one at a major bank and one at a utility. Were laid off and told that if they didn’t hang around to train their Indian replacements, they wouldn’t get the severance package. But if you’d rather believe the crony corporatist explanation that they can’t find enough Americans qualified to do these jobs, sure. Also you might like to know that the last census was taken in 2010 which is basically ancient history for our purposes. Actually the source for the increase was the US Census Bureau. Your source is? Those are just estimates that base from the 2010 census and then use academic formulas to extrapolate forward, again it’s ancient history. In terms of real estate I don’t care much about the population figures, I care about the demographic of willing and able buyers (and with affordability like ours we must place great emphasis on the able), their liquidity (source of funding), and the factors that attract or repel them from the area (in our case, I would emphasize a falling quality of life). Indeed affordability is key. For buyers, renters and for investors – for the economic health of a region. Census figures are a factor – one wants good growth in jobs and population along with acceptable affordability levels. Of course quantity isn’t everything – one wants quality (as in of life) too. The Bay Area does not posses that as seen in the large domestic out-migration from the region and the polls showing a large chunk of millenials planning on moving to greener pastures in the coming decade. Yes! Some young people leave. And then other people move in! It’s been that way in San Francisco for decades. SF’s population and the population of the nearby counties are still growing. Indeed Dave, strong job growth in the Bay area has hurt affordability of housing. Going by the data from the Census Bureau you will see that the out of state migration yields a small gain for San Francisco – the out-migration from the city goes mostly to Alameda & San Mateo Counties. If you look, you’ll see that prior to 2016, SF domestic migration was positive (as was net migration for SC and SM). It’s only since 2016 that SF domestic (and SC, SM net) migration turned negative. A decrease in population growth is not the same a losing population. No one is claiming that. The Bay Area is growing but at a slow rate. About the rate of the US as a whole but much slower than Seattle, Portland, Phoenix, Atlanta, the Texas cities and other more robust metros. Does the long-term decline in volume show up in earlier graphs? All else being equal I would expect volume to drift upward due to new construction – is the downward trend because of conversions to rental or something else? Prices are skyrocketing because SF’s lofty housing projections are totally bogus. The developing scandal involving Tetra Tech’s fraudulent cleanup of HP and TI mean that 1/2 the pipeline just evaporated. It is curious that quasi-governmental contractor $TTEK faces no penalty from the Feds, the Navy, EPA or SF. Where is the D.A. and the City Attorney? Someone must be held accountable. Why is nobody taking action? No one is going to be held ‘accountable’. The Navy wanted to get rid of the land as quickly as possible. 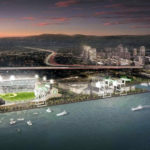 The Redevelopment authority? The Developer? They want to build housing and make a profit as quickly as possible. The SF politicians? They are there to facilitate it all. $$. The only reason it’s even in the news now is some disgruntled whistle blower employees won’t let it die in the media. It doesn’t matter how polluted is is – it is SF real estate. It will be covered in housing in 10 years. quickly? Excuse me? How long has Hunters Point Shipyard been closed? How many years (decades) has it been going through the planning process, which included the Navy preparing the land to be transfered to the City (and then sold to Lennar/Five Points). This process is anything but QUICK! Good point. You’re right. It’s more of a slow motion debacle than a fast moving train wreck. This poor neighborhood has been suffering since they founded the Naval Radiological Defense Laboratory (NRDL) here in 1946 and started dumping waste in the Bay. The revelations of the clean-up contractors not doing their job has been a bit of a whirlwind for me. Tetra Tech $TTEK needs to be held accountable. They have committed criminal fraud with the assistance of the SF and Federal government Kleptocracy. Nobody wants to dig too deep because if you follow the money it ends up close to the powerful. 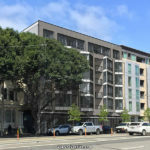 This is the biggest real estate story of the year in SF and I would love Socketsite to expose it. Lennar has some interesting political links. Indeed – family that is all for the poor but manages to be uber wealthy. Not sure how much this might impact the HP/CP developments and TI. If independent studies show a not too confined contamination then part of the projects may be in jeopardy. I don’t think they totally evaporate. The TI project is iffy because of the structural work needed. Who pays for that? The taxpayer? Who benefits? Lennar? IMO TI needs to be scrapped as currently envisioned and redone as a public amenity project. Museum possibly? As the editor and others have repeatedly pointed out, medians are not a good measure of price changes. A $2M home that re-sells apples-to-apples for $1.5 will actually *raise* the median price!! And this site has featured some examples of this sales like this occurring recently. Also, as has been repeatedly pointed out the last cycle did not go from straight up to straight down, rather it had a year+ flat period at the top. And the flat period was not tabletop flat, it had its small ups and downs. It takes time for the general public’s expectations to change and for them to act on a new economic reality.